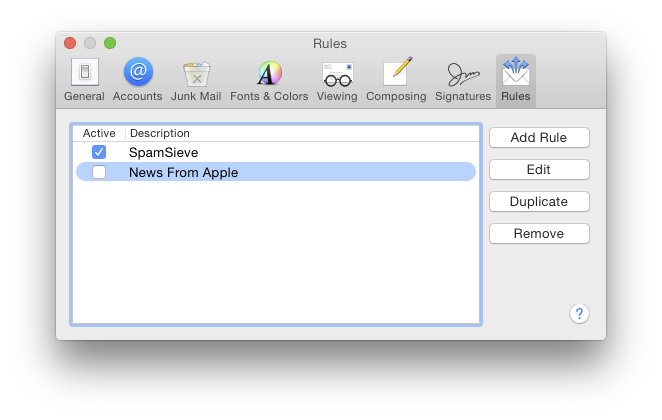 In addition to these written instructions, there are a screencast video and video review that demonstrate how to set up and train SpamSieve with Apple Mail. If you are using macOS 10.14, make sure that SpamSieve has full disk access by going to System Preferences ‣ Security & Privacy ‣ Privacy. This is described in more detail in the Security & Privacy Access section. If you are using macOS 10.13.x or earlier, you can skip this step. Quit Mail. Then double-click the SpamSieve application and choose Install Apple Mail Plug-In from the SpamSieve menu at the top-left of the screen. Now relaunch Mail. If you are using macOS 10.14, you will need to click Manage Plug-ins… in Mail’s preferences and enable SpamSieve.mailbundle. This is described in more detail in the Enabling and Updating the Apple Mail Plug-In section. If you are using macOS 10.13.x or earlier, you don’t have to enable the plug-in. If you do not see these commands, please see the Why don’t I see the SpamSieve commands in Apple Mail’s Message menu? section. Choose New Mailbox… (or New…) from Mail’s Mailbox menu, and create a new mailbox called Spam with location On My Mac. The capitalization is important; do not call the mailbox SPAM or spam. Note: See the Using a Spam Mailbox on the Server section if you prefer to have your spam accessible from all your devices. If you are using Gmail, see the Keeping Spam Messages Out of Gmail’s Archive section. Choose Preferences… from the Mail menu and click the Rules button in the toolbar. Click the Add Rule button. Change the description to SpamSieve. Note: The description of the rule must start with SpamSieve, but you can add additional text after that, if you want, so long as you don’t use square brackets, which SpamSieve uses those for color rules. Note: Although the rule looks like it will move every message to the Spam mailbox, because you have installed SpamSieve’s plug-in, it will only move the spam messages. Drag the SpamSieve rule to the top of the list so that SpamSieve will be able to filter all of your mail. If you ever need to temporarily disable SpamSieve, e.g. for testing purposes, you can do so simply by unchecking the rule. Make sure that the list shows no other rules for processing spam/junk messages. If you find any, disable them (by unchecking them) or delete them. Note: You may want to empty your trash before deleting the spam messages. This will prevent them from being mixed with good messages in the trash. Go to the Junk Mail tab of Apple Mail’s Preferences window. If there is a Trust junk mail headers in messages option, uncheck it. Uncheck Enable junk mail filtering. This will disable its junk mail filter so that it doesn’t interfere with SpamSieve. Now proceed to the Do an Initial Training section. 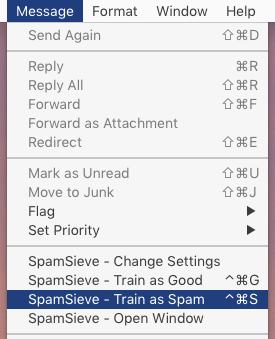 To train SpamSieve with spam messages, select one or more of them in Mail and then choose SpamSieve - Train as Spam from the Message menu. (There should be spam messages in the Trash from the prior step, which you can use for the training.) The messages will be colored in gray and moved to the Spam mailbox. To train SpamSieve with good messages, select one or more of them and then choose SpamSieve - Train as Good from the Message menu. Even with Mail’s built-in junk mail filter disabled, Mail may show a Not Junk button at the top of spam messages; you should ignore this, i.e. always choose SpamSieve - Train as Good rather than clicking the Not Junk button. On macOS 10.14, the first time you try to train a message macOS will ask for permission to control Mail and SpamSieve, and you should click OK. When training multiple batches of messages, you should wait for Mail and SpamSieve to finish processing one batch before training the next. Note: If it takes more than a second or for the messages to move after you train them, please see the Faster Apple Mail Training section. SpamSieve will process new mail automatically and move the spam messages to the Spam mailbox. Mail may still color some messages brown and show them in the special Junk mailbox, even though its own junk filter is off; this is normal. The Junk mailbox holds spam messages caught by server-side junk filters before they got to your Mac. These messages are not processed by SpamSieve, so they are not mistakes and should not be trained as spam. It’s also normal for messages in the Spam mailbox to say that you marked them as junk; this is is because SpamSieve told Mail that they were junk on your behalf. It’s fine to have additional rules in Mail for processing your good messages. Just make sure that they are below the SpamSieve rule. If you ever need to manually ask SpamSieve to sift through a mix of spam and good messages, select the messages and choose Apply Rules from the Message menu. SpamSieve will move the ones that it thinks are spam to the Spam mailbox. The above is all you need to know about using SpamSieve with Mail. The Apple Mail Customization section explains some more advanced setup options, such as configuring the “new mail” notification sound. If you need to troubleshoot SpamSieve and Apple Mail, see the Checking the Apple Mail Setup section and the Apple Mail–Specific Questions section.